I hoped if I saw Anthony the words would go away. Regardless, I had to see him one last time. My small family and I went to the funeral home. We went in together then each one of us had our time alone. Anthony felt so cold. I talked to him and cried. Being short, I had to stand on my toes in order to kiss him on the forehead, the coffin shifted and for a minute I thought it was going to fall off the end. It was almost as if he had played one last trick on me and certainly helped lighten the moment. More than 300 people attended the memorial service. I knew Anthony was well loved I just hadn’t realized how much. My aim was to curl up in a corner and be out of sight. There were no corners. His best friend, Kenny, and I sat together and I’m not sure who held the other’s hand tighter. My son, Kenny and I spoke. Speaking was something I had to do for Anthony and for me. It was tough but I got through it. A representative from the Social Work field talked about how he will be missed and what a wonderful person he was. One of Anthony’s expressions was. ‘Feel the love. Do you feel the love?’ Well, there was so much love in there that day. The reception room was swamped with people lining up for ages to speak to us. Their hugs and supportive words helped me get through that day. I slept at my son’s house a few more nights. Their Bull Mastiff even crawled on to the couch with me one night. My friends are amazing. I have reconnected with old friends and made new ones. I now have two surrogate brothers, great neighbours. And of course, I have my two grand daughters, my son and daughter in law. Nothing makes you forget your grief for the moment like a six-month-olds’ grin. Yes, I am lucky; I am loved and supported more than I ever knew. I have a long way to go on this journey of recovery but it won’t always have to be alone. Someone told me that it takes 13 months to stop grieving. A year to pass every major event, birthdays etc., and a month to get past the year. Sounds too easy. People are always telling me how strong I am. I’m not. I’ve learnt how to survive. Anthony’s dead. I can’t talk about that without crying. I wear a protective necklace to help overcome grief, I have acupuncture emotional release massages, I play solitaire, I have pedicures and manicures and I cry, a lot. All I really want is someone to tell me it was just a bad dream. Anthony McGregor,was born on August 10, 1976 just outside of Toronto, Canada. After school and college he worked as a chef/bartender. While volunteering in a seniors' residence, he felt that his life could be better spent in Social Work. 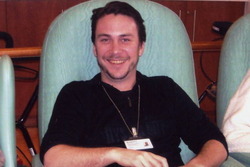 Anthony had four months left in his Master of Social Work programme. He had a wonderful way with the seniors. When he passed away on November 30, 2009, they lost a great mentor. Patricia McGregor is a writer, photographer and a much loved member of the YourLifeIsATrip.com family.